In a large heavy lidded pot or Dutch oven, brown the pancetta over high heat until crispy on all sides. Remove to a plate. Season the pork with salt and add to the pot (depending on the size, you may need to do this in two batches). Brown the pork on all sides, about 5 minutes total. Remove to the plate with the pancetta. Add the onion and sauté over medium-high heat until soft, about 5 minutes. Stir in the parsnips and cook until lightly browned, 4 minutes. Pour in the bourbon or calvados and scrape up any brown bits from the bottom of the pan. Add the rosemary, pork and pancetta to the pan and cover with the cider, stock, and vinegar. 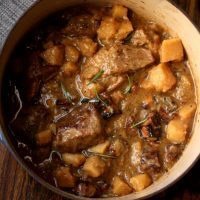 Bring to a simmer, cover, and cook for 2 hours, stirring once, until the pork is fork tender but not completely falling apart. In a small bowl, stir together the butter and flour. Stir into the stew along with the mustard. Simmer 10 minutes more until thickened. Taste for seasoning and add more salt as necessary. Serve warm alongside semi-sweet potato mash. Using a sweeter cider will suit this recipe just fine. I used Harpoon, but any brand will work.